I’ve seen recipes for simmered spinach in dashi in innumerable Japanese cookbooks before, but it wasn’t until recently that I considered using Swiss chard in place of spinach. The results were delicious and I’ve since discovered that any mild leafy green goes well with this simple dashi-based sauce. Dashi is a type of stock used in loads of Japanese dishes and is generally made by soaking and heating kelp seaweed in water, often with the addition of small dried sardines and dried bonito flakes. The whole thing is then strained and used to make soups, broths, and simmering liquids. 1. In a medium pot, bring salted water to a boil. Cook the greens briefly until crisp-tender, then drain in a mesh strainer. Rinse with cold water to stop cooking. Lightly squeeze excess water and cut the greens into 2-inch segments. 2. Arrange in tight bunches in serving bowls. 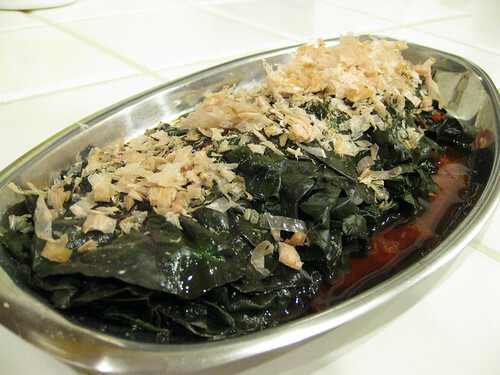 Combine dashi and soy sauce, pour over the greens, and garnish with the bonito flakes. 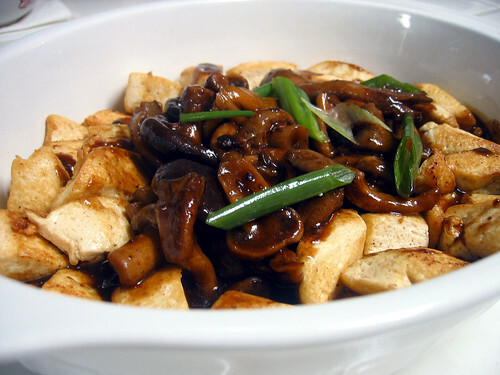 I’ve been on a tofu kick lately, and I can’t think of a better way to cook it than with mushrooms. Both are rich in protein and lend this dish a rich, meaty flavor despite having no meat at all. This Japanese rendition, adapted from Izakaya: The Japanese Pub Cookbook, is wonderful on its own or with steamed rice. 1. Wrap the tofu in two layers of paper towels and place in a flat-bottomed dish with sides. Place a light weight such as another flat dish on top, and leave about 30 minutes to drain excess moisture. Wipe any moisture from the surface of the tofu and slice horizontally. Slice each half into eight rectangular pieces. Set aside. 2. In a large frying pan, heat the oil to medium-high and carefully slip the tofu pieces into the oil. Deep-fry until golden brown, 3-4 minutes. 3. In a medium saucepan, combine the dashi, soy sauce, mirin, and mushrooms and bring to a boil. Lower the heat and pour in the cornstarch slurry to thicken the sauce. Remove from heat as soon as it comes to a boil. 4. 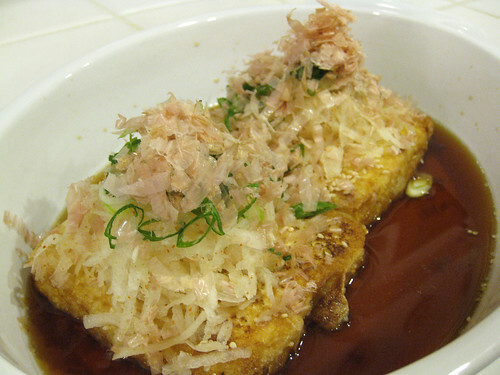 Place the fried tofu pieces in a serving dish, ladle the sauce over, and top with the grated daikon and ginger. Garnish with the fried peppers and green onion. Most of the time when I dine out for sushi, I order an appetizer of agedashi tofu to start things off. It’s a simple Japanese dish of deep-fried silken tofu, and I love the textural contrast of the crispy outside and the piping hot, creamy tofu on the inside. The whole thing is served in dashi broth and topped with shredded daikon radish and green onions. Despite being deep-fried, the tofu absorbs very little oil, so I don’t feel bad about eating it. I recently learned to make this dish at home when I was gifted Izakaya: The Japanese Pub Cookbook by a friend. I have a few Japanese cookbooks, but this has quickly become my favorite. I’ve already cooked this rendition of agedashi tofu several times. 1. Mix the shredded daikon with the chili pepper and set aside. 2. Bring mirin, soy sauce, and dashi to a gentle boil and turn off heat. Add bonito flakes and leave for 10 seconds, then strain through a mesh strainer. Set sauce aside. 3. 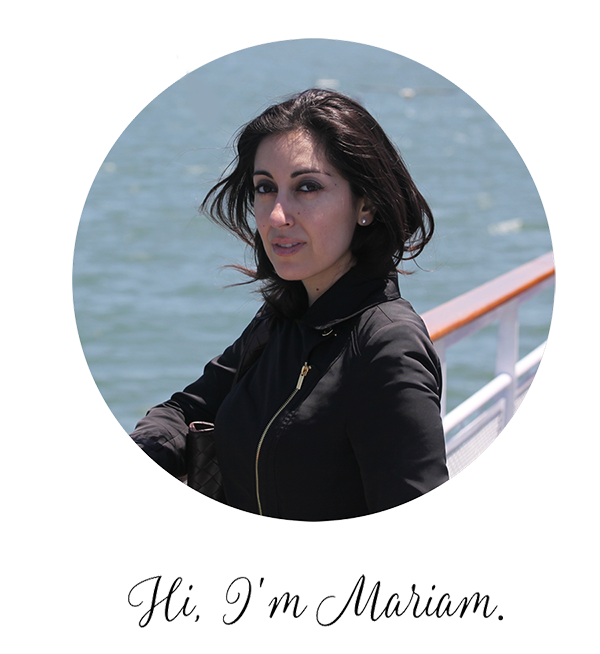 In a heavy saucepan, heat 2 inches oil to medium-high heat. 4. Slice tofu horizontally into 2 pieces. If desired, slice each of these 2 pieces in half as well. Blot tofu dry and coat with potato starch. Fry the tofu until the surface is golden and crispy, about 5 minutes. Carefully transfer the tofu with a slotted spoon onto a paper-lined plate to drain excess oil. 5. Place tofu in a serving bowl and pour in the sauce. Garnish with the green onions and shredded daikon radish. 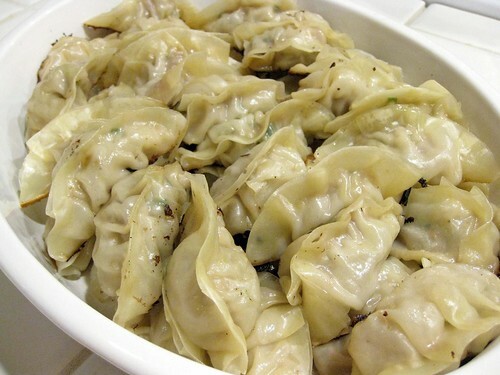 Gyoza, or Japanese potstickers, differ from their Chinese counterparts in that they have a thinner wrapper. They have a richer garlic flavor too, and are usually served with a soy-based rice vinegar and chili sauce. Sometimes I make a double batch as I’m wrapping the gyoza and stick the extras in the freezer – they make for a quick, delicious meal later on, and they’re much healthier than the store-bought frozen version. 1. In a bowl, toss cabbage with salt; let stand for 10 minutes. Drain and press cabbage to extract excess moisture. Add ground chicken, water chestnuts, 3 minced green onions, sake, oyster-flavored sauce, 1 tablespoon ginger, garlic, and cornstarch; mix well. 2. In another bowl, combine rice vinegar, soy sauce, chili garlic sauce, sesame oil, remaining minced green onion, and remaining 1/2 tablespoon of minced ginger to create dipping sauce. Set aside. 3. To shape each potsticker, place a teaspoon of filling in center of one wrapper. Brush edges with water; fold wrapper over filling to form a half-moon. Press and pleat edges to seal. Set filled potsticker down firmly, seam side up, so that it will sit flat. 4. Place a large nonstick frying pan over medium-high heat until hot. Add 1 tablespoon oil, swirling to coat sides. Add half of potstickers, seam side up, and cook until bottoms are golden brown, about 4 minutes. Add 1/2 cup broth, reduce heat to low, cover, and cook until dumplings are tender and liquid has evaporated, about 10 minutes. 5. With a spatula, remove potstickers from pan and place them on a serving platter. Repeat to cook remaining potstickers. Serve warm with dipping sauce. This is one of the first Chinese dishes I learned to make. I was still a kid and had just picked up Martin Yan’s Culinary Journey Through China, and though I didn’t really care for tofu at the time, I wanted to acquire a taste for it. This is the dish that did it. Browning the tofu long enough to create a crispiness on the outside and spongy texture on the inside is key, so don’t rush this stage of the recipe. If you do it right, the browned tofu absorbs the savory, salty black bean sauce perfectly. 1. Cut tofu in half horizontally to make 2 pieces. Slice each of these halves into six rectangular pieces to make a total of 12 slices of tofu. 2. Combine the chicken broth, black bean garlic sauce, oyster flavored sauce, sugar and sesame oil in a bowl to make the sauce. 3. Place a wok over high heat until hot. Add 1 tablespoon oil, swirling to coat sides. Add the tofu and cook, turning once, until golden brown, 2 to 3 minutes on each side. Remove tofu and set aside. 4. Add the remaining 1 tablespoon oil, swirling to coat sides. Add the mushrooms and stir-fry for 1 minute. Add the sauce, reduce heat to low, and cover, then simmer until the mushrooms are tender, about 5 minutes. Add the cornstarch solution and cook, stirring, until sauce boils and thickens. 5. To serve, arrange the tofu in a circle around the edge of a serving plate. 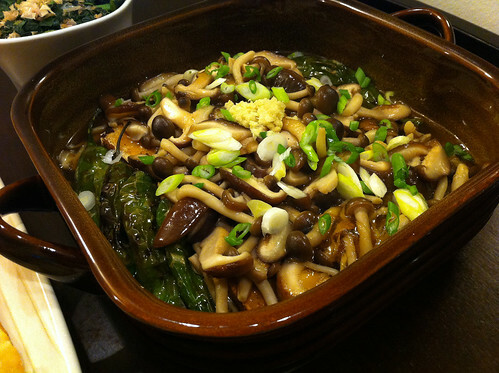 Place the mushroom mixture in the center and garnish with green onions.